Had a bunch of posters to put on the eBay, and while this one was just a little too beat up to put up for sale, I went ahead and photographed it anyway and kept the picture aside for a rainy day here on this site. So, any pogs or are you just saving the best for last? I foresee this lasting longer than Tekno Comix’s actual run as a relevant comics studio. It’s weird, but I was barely aware of them as a studio. To me they were a little mall kiosk where I could get the last few Sandman TPBs as they came out. I wish they’d stuck around (and been better quality). Roddenberry’s Lost Universe and Nimoy’s Primortals were tripe with endorsement deals, but Gaiman put his name on two series called Lady Justice and Mr. Hero that were interesting. There was also Mickey Spillane’s Mike Danger (Mike Hammer if the Nazis won WWII). It’s classic 90’s growing-pains comics, the kind of stuff that would be better in a different format (OGN, Euro/underground) but hampered by the monthly pamphlet and the expectations of the time. I remember enjoying Mr. Hero as well, while it lasted. The Tekno Comix store at the Mall of America was pretty nice. And its sign was a massive 3-D representation of that hand coming out of the wall and holding the logo–Super Extreme! Teknophage is one of the great lost comics of the 90s. You would think someone would grab the rights to these things and get them up on Comixology. Wonder if that’s impossible? yeah, a big giant fascist robot hand makes ME want to buy comics! GREAT MARKETING, THERE. 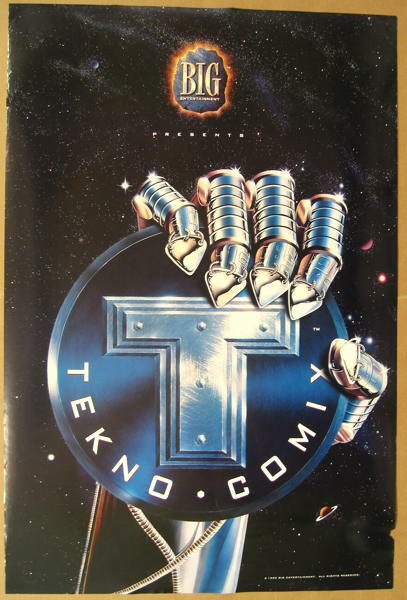 I worked for Tekno Comic at one of their kiosks during the 90’s. . We all went to a managers meeting in Ft. Lauderdale for several days. They really made the trip nice for us. However during a game we were playing, we were asked numerous trivia questions about the story lines in Tekno comic ….we all failed….AND as employees we were given free copies of each issue! I personally never read a single one….and apparently neither did any other manager. Oops….. I personally never ever believed anybody else discussed my personal opinions on this specific subject matter. Many thanks for confirming my values as well as rendering this content so very crystal clear and straightforward to read through. I personally believe you have got plans on composing more.